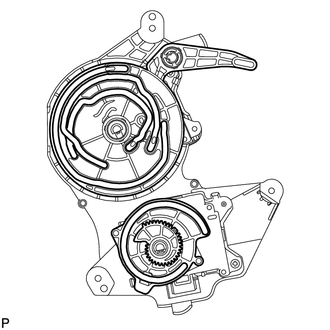 (a) Check that the slots, links and gears of the air outlet control servo motor sub-assembly are positioned in the correct orientation as shown in the illustration. 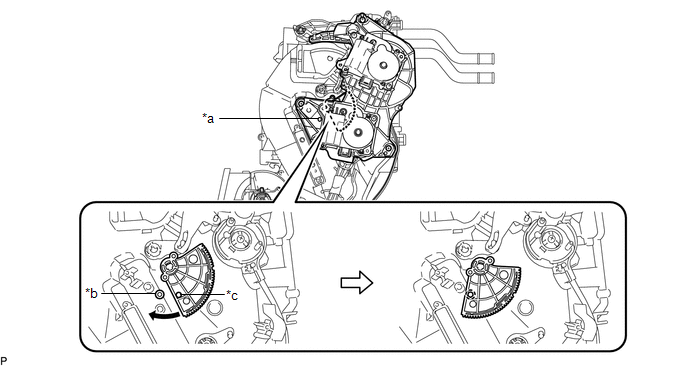 (b) Face the contact surfaces of the air outlet control servo motor sub-assembly and air conditioning radiator assembly for the air outlet control servo motor sub-assembly upward. 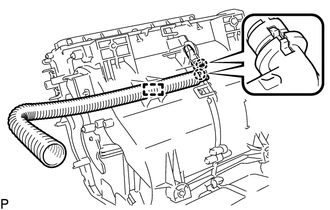 (c) Rotate the link of the air conditioning radiator assembly all the way to the left as shown in the illustration. 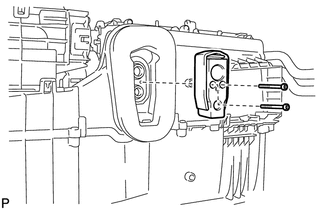 (d) Rotate the link of the air conditioning radiator assembly to the bottom as shown in the illustration and confirm that the mode switching duct hole is fully closed. 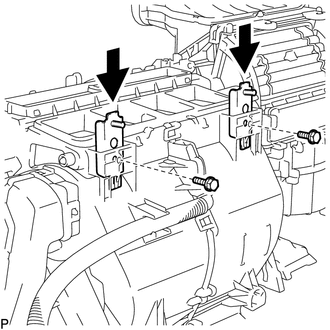 (e) Rotate the lever of the air conditioning radiator assembly to the top as shown in the illustration. 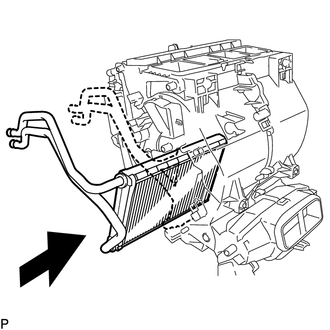 (f) Rotate the link of the air conditioning radiator assembly to the in-line position as shown in the illustration. (g) Wrap the upper and lower links with vinyl tape to hold them in the in-line position. 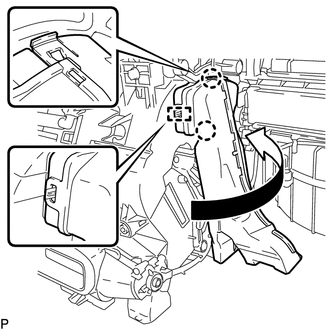 (h) Install the link of the air outlet control servo motor sub-assembly to the link guide pin (A) of the air conditioning radiator assembly as shown in the illustration. 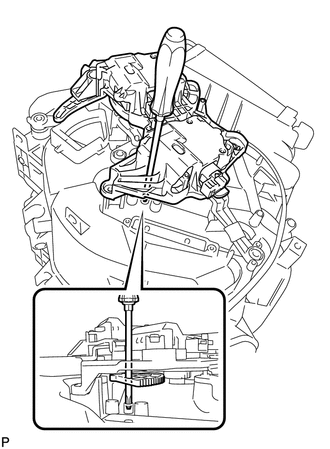 (i) Install the guide hole of the air outlet control servo motor sub-assembly to the guide pin of the air conditioning radiator assembly as shown in the illustration. (j) Temporarily install the screw (up to 4 or 5 threads). 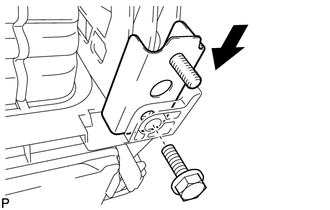 Make sure that the link guide pin (B) is inserted in the air conditioning radiator assembly slot. 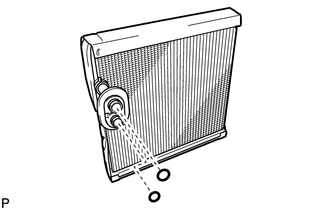 Avoid tilting the air conditioning radiator assembly during installation. This helps to prevent the guide pins from coming out of position. 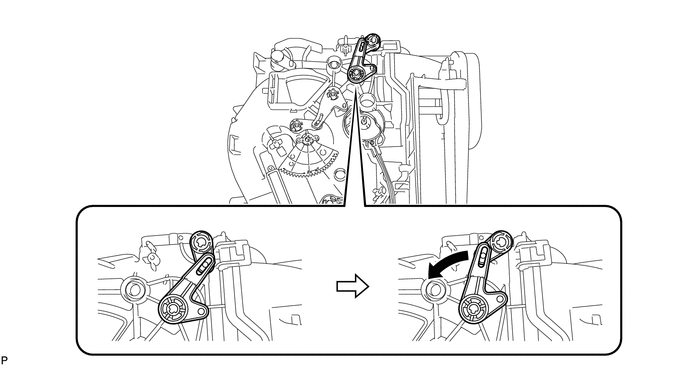 (k) Lift the air outlet control servo motor sub-assembly slightly to create clearance. 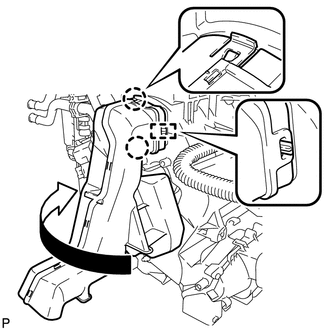 (l) Move the air conditioning radiator assembly gear so that alignment holes of the air outlet control servo motor sub-assembly and air conditioning radiator assembly are aligned. (m) Insert a screwdriver into the aligned holes as shown in the illustration. 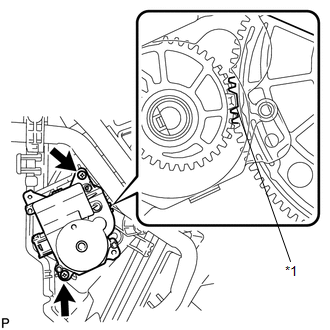 (n) Make sure that all the links and gears are in the positions shown in the illustration. Screwdriver is inserted into alignment holes. Link guide pin is inserted. Links is positioned to left side. Links is positioned at bottom. Each link guide pin is inserted in its air outlet control servo motor sub-assembly slot. Lever is positioned at top. (o) Push the loose fitting air outlet control servo motor sub-assembly into position. 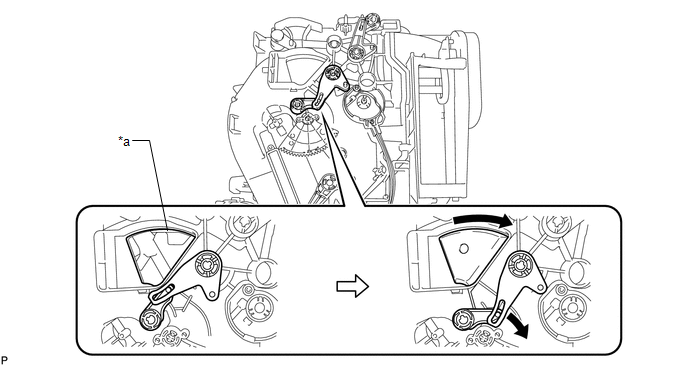 Make sure that the air outlet control servo motor sub-assembly is fully pushed into position. After pushing the servo into position, keep it in place by holding it until the screws are installed. Push the air outlet control servo motor sub-assembly until a click sound is heard. (q) Fully install the top screw, and then install the air outlet control servo motor sub-assembly with the 2 remaining screws. (r) Remove the vinyl tape. 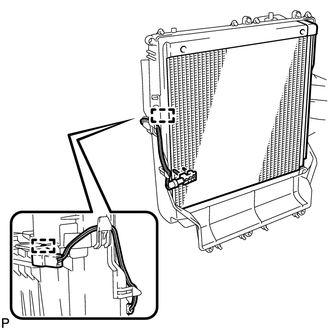 (a) Install the heater radiator unit sub-assembly as shown in the illustration. (b) Install the clamp with the screw. (c) Engage the 3 claws to install the heater clamp. 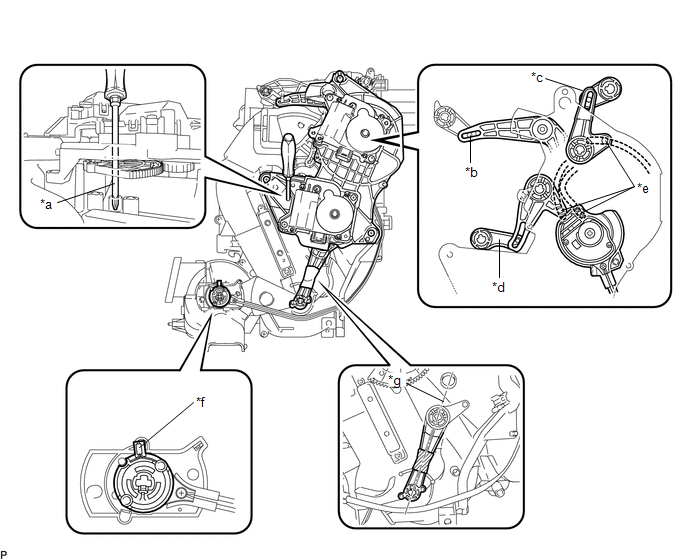 (a) Using the reference point, install the air mix control servo motor sub-assembly with the 2 screws. 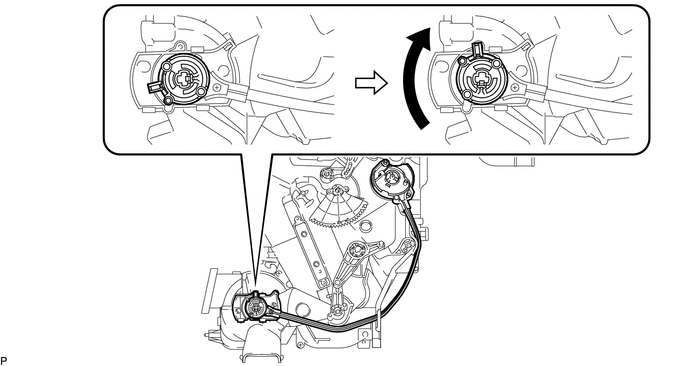 (a) Engage the 2 claws and clamp to install the aspirator pipe. (a) Sufficiently apply compressor oil to 2 new O-rings and the fitting surfaces. (b) Install the 2 O-rings to the cooler evaporator sub-assembly. Keep the O-rings and O-ring fitting surfaces free from dirt or any foreign objects. 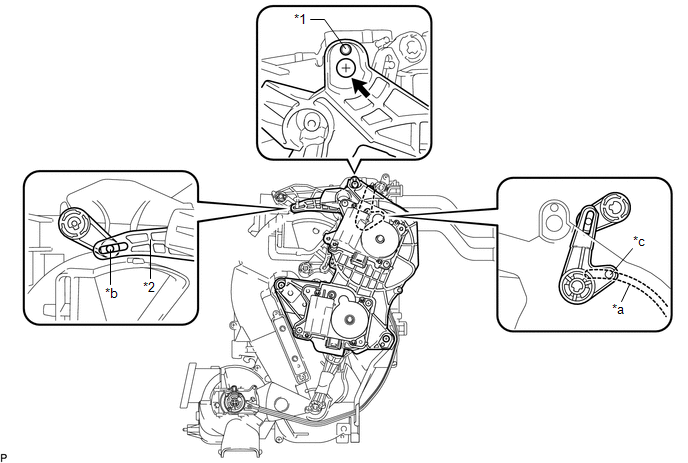 (c) Engage the clamp and install the cooler evaporator sub-assembly with the No. 1 cooler thermistor. (b) Engage the guide and connect the wire harness. 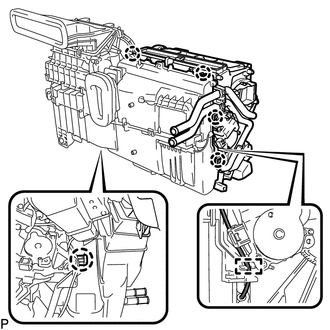 (c) Install the air conditioning radiator assembly to the blower assembly with cooler evaporator sub-assembly with the 6 screws. 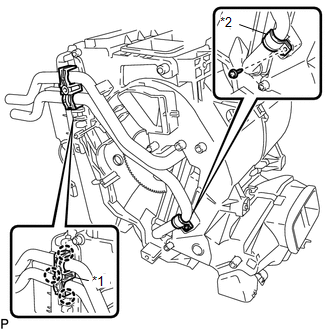 (a) Using a 4 mm hexagon wrench, install the cooler expansion valve with the 2 hexagon bolts. 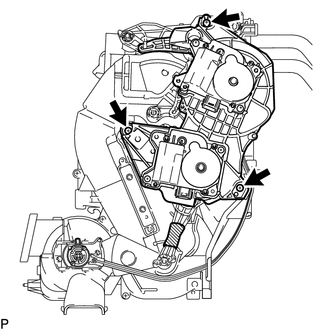 (b) Engage each clamp to install the air conditioning harness assembly. 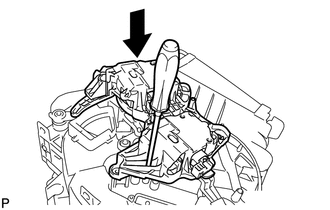 (a) Engage the guide and 2 claws to install the No. 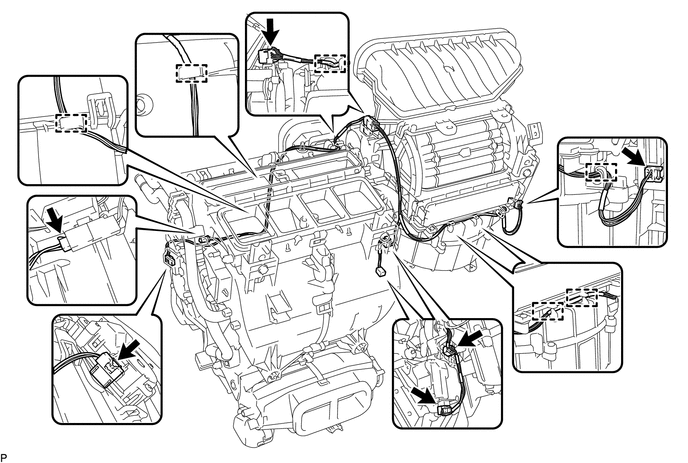 2 air duct sub-assembly as shown in the illustration. 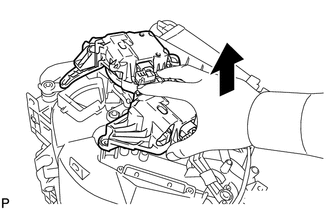 (a) Engage the guide and 2 claws to install the No. 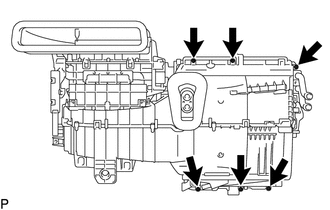 3 air duct sub-assembly as shown in the illustration. (a) Install the No. 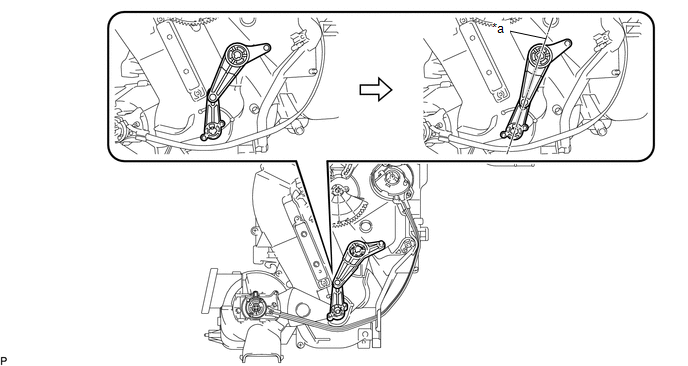 2 finish panel mounting bracket with the bolt as shown in the illustration. (a) Install the 2 No. 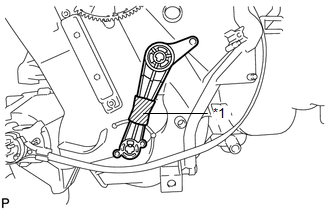 1 finish panel mounting brackets with the 2 bolts as shown in the illustration.